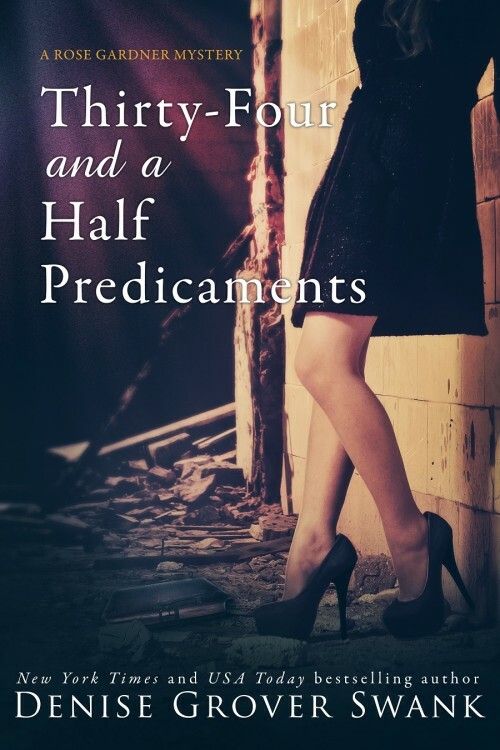 Thirty-Four and a Half Predicaments is Now Live! Join the Facebook Discussion group when you finish! Book seven in the New York Times and USA Today bestselling Rose Gardner Mystery series. I turned around to see my former neighbor standing in line behind me. The octogenarian looked the same as ever—cranky—only there were some new faint blue streaks in her white hair. Fair enough. I turned my back to her. “I never stripped! I never even took my clothes off!” I protested louder than I’d intended. She didn’t need to know Neely Kate had taken a disastrous turn on the stripper pole. A mother with two small children was rounding a corner just then, about to head down another aisle. Her mouth dropped open and she gave me the stink eye as she shoved her poor preschool-aged boy on the other side of her, away from me, as though my presence might somehow infect him. Only she pushed him a little too hard and he crashed into a cereal box display on the endcap. An avalanche of boxes came crashing down on him and his mother. “Look what you did!” Miss Mildred shouted, louder than any loudspeaker could hope to be. Every person in the front of the store turned their attention to her. The store manager walked toward the cash register as Bennie—who was sacking my groceries—stared, taking everything in. That wasn’t the reaction she’d wanted, but she clamped her mouth shut. The store manager had rushed over to help, but he kept throwing glances my way that clearly said he was trying his best to figure out how to blame me for the latest mishap. Thankfully, the cashier said, “That will be one hundred and thirty-six dollars and fifty-nine cents.” Her tone let me know she was just as eager to be done with me as her boss was. “You did a great job, Bennie,” I said as I dug through the cash in my wallet. The girl was crying louder and her brother had joined in the chorus, although not because he was hurt—he was upset his mother had dug him out of his new fort. The afternoon had gone from bad to worse and I just wanted to go home. When I realized I didn’t have enough cash, I handed the cashier Mason’s credit card. But Ed was too busy tripping over boxes and dealing with the irate mother to hear her. The mother looked up at me like I was one of the horsemen of the apocalypse. Accidentally erased book on iPad. Pre ordered. Please sent to me again. Thank you. Oh My!! I can not wait till this fall! I love your story’s about Rose. This last one was awesome, but you killed me with the ending :). I cursed quite a bit, and read the last few pages again and again. You got me hooked, reeled me in and BAM! Nice job! Bring on the next adventure.